I ran through the thickest section of the East Shroud, appropriately named the Bramble Patch, ducking and dodging thick, thorny vines and roots as I chased after Claxio. The Sylph hadn’t strayed far from Little Solace, but after speaking to him he refused to return to the encampment and dashed off deeper into the woods. I cursed under my breath as a branch slapped across my leg, thanking the gods for my leather highboots that prevented the thorns from causing any lasting damage. I couldn’t say the same for my corselette, the fabric catching on nearly every thorn, leaving pieces of my top in my wake. I finally emerged from the brambles into an open space, the thick vines almost making a domed ceiling above me. Claxio had stopped running, but only because he had come face to face with Tempered Sylph. 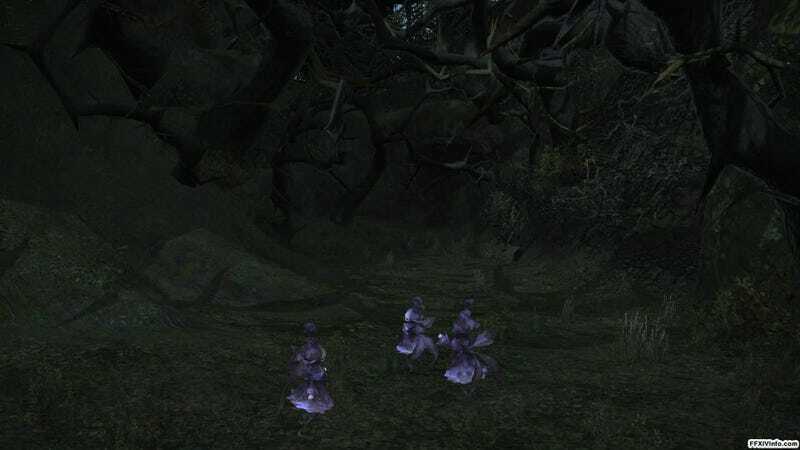 These thralls of Ramuh weren’t completely unlike the free Sylph. Rather than the natural green of vegetation they were deep hues of purple and I could feel the electrical power of the Lord of Levin emanating from them. Before the Tempered Sylphs could grab hold of Claxio I threw a magic missile at the nearest one, drawing their attention. As the three Sylph came for me I quickly summoned a Carbuncle familiar and sent it into the fray. One Sylph engaged in combat with Carbuncle, trading blows while the other two held back and struck with balls of thunder. I flipped through the pages of my grimoire, looking for a spell. Upon finding it, I casted the magic that would sustain Carbuncle under the assault while I picked the Sylph off one by one. I poisoned the group with Bio and Miasma spells, then lobbed Ruin after Ruin spell. I could smell something terrible approaching long before I saw it. Out of the thick brambles came a monstrosity that is enough to send even seasoned adventurers running. The Marlboro are a plant like creature that is all mouth and a wriggling mass of tentacles. Known mostly for their odorous breath that was capable of delivering a severe affliction of ailments, they were one of the most dangerous creatures in Eorzea and I had one barreling straight at me. A gout of flame leapt out of the brambles and struck the Marlboro, sending the creature off course. Papalymo and Yda emerged from the brush and they surmised that the creature was under control of the Tempered Sylph. They’d distract it long enough for me to defeat the Sylph, then we’d be able to make our escape. The Pugilist and Thaumaturge drew the beast away and I refocused on the Sylph. After applying the sustaining spell on Carbuncle again I continued my salvo of magic on the leafkin until they finally fell. As the Scions had thought, the Marlboro immediately went into a blind rage and we made a quick exit back into the bramble patch. Komuxio was overjoyed to see us when we returned with Claxio in tow. The Sylph deeply apologized for running away, but Komuxio was too happy to be angry. It seemed as though I had finally earned Komuxio’s trust, because he told me that he would let me speak to their Elder. At least, he would if their Elder hadn’t gone missing. He had been gone for days now and no one knew where he had went. Knowing that I was an honest and trustworthy person, Komuxio pleaded that I request the aid of the Twin Adder’s in finding the Elder Sylph. I resisted the urge to berate the Sylph for not telling me sooner, but agreed all the same and made camp for the night at Little Solace. Upon returning to Gridania the next morning, I reported everything that had occurred to Commander Vorsaile Heuloix. He agreed to putting the manpower into locating the Sylph Elder, then suggested I enlist the aid of a man named Buscarron who owned a Tavern in the Southern Shroud. Being a tavern owner he would be sure to have heard any information concerning the missing Sylph. After spending some time waiting for my clothes to be mended, I took Gale Claw from the chocobo stables and set off toward Buscarron’s Druthers. Buscarron turned out to be much like many of the tavernkeeps I had met. He was mostly concerned about keeping the ale flowing, the coin coming in, and gathering as much information to sell on the side as possible. He hadn’t heard anything about the missing Sylph Elder, but promised to keep an ear out if I could make it worth his while. I told him that an Adventurer’s pay was lousy, as I was sure he knew very well, and that the Serpent Seals I was paid with by the Grand Company would be of no use to him. Buscarron, ever the businessman, told me that I could just as easily pay in favors, and the first thing I could do was break up a bar fight that had just erupted outside. I stepped outside to find a number of drunkards had decided to go a few rounds of fisticuffs with one another. The damage so far had only been to each other, but it wasn’t long before the fight turned into a full scale brawl and collateral damage became an inevitability. I regarded the fight for a moment, my hands on my hips and a frown etched across my face. I noticed an empty bucket sitting nearby, and not much further north of the tavern a flowing stream. I strode purposefully past the fight, picked up the bucket, and to the stream. I filled the bucket and marched back to the fight. “Oi! Knock it off or the lot of you can just bugger off!” I shouted, splashing the group with the icy water. “Or would you rather have to answer to Buscarron?” My threat seemed to have worked because the group of troublemakers skulked away from the tavern, dripping wet. I smirked at the sight of their backsides as they withdrew and told the tavernkeep that the problem had been resolved. He told me that he had no problem with his clientele so long as they paid their due and caused no trouble, and I could see the sense in that. I asked Buscarron how many more drunks I needed to kick out before he’d agree to help with the missing Sylph, and he joked about not wanting to lose any more business. He set a pair of fancy earrings on the bar table and told me that they had belonged to a Qiqirn, a former employee of the his, and would like to see them returned. Teteroon, the Qiqirn in question, had set off to Limsa Lominsa to become a merchant. I told the tavernkeep that he better have the information I needed when I returned, took the earring, and made the return trip to Gridania. I landed in Limsa Lominsa in the evening and went directly to Hawker’s Alley in the lower level of the city. The street there was usually lined up with merchants of all kinds and I had recalled seeing Qiqirn merchants there before. I spoke to a Qiqirn named Kyokyoroon that Teteroon had taken his wares to Memeroon’s Trading Post in the Upper La Noscea region. The mouse-like beastman held his paw out to me, requesting the much coveted “clink-clink” and I dropped a couple gil into his grubby hands. I just can’t seem to win when it comes to information, can I? I had brought my chocobo along on the flight to Limsa Lominsa and found him waiting for me at the stables the next morning. We set off to Upper La Noscea and found Memeroon’s Trading Post on the edge of Bronze Lake. The lake was massive and in the center there was a large structure known as the Wanderer’s Palace. I had heard that on the other side of the lake there was a hot springs. As much as I could have used the relaxation, I knew I needed to finish this favor for Buscarron. Teteroon was luckily there at the trading post still and was extremely happy to have his treasured earrings back again. He was so happy, in fact, that he began to reminisce about his time working at Buscarron’s Druthers. Teteroon decided that he wanted to send back a gift to Buscarron in thanks for having me deliver his earrings and handed off to me a bottle of Qiqirn Firewater, a potent beverage. He explained that he had recently brewed it for himself, but would rather Buscarron have it. I safely packed the bottle of liquor away and made the return trip to Limsa Lominsa. I returned to Gridania by mid-day and was back at Buscarron’s Druthers once more a few hours later. The tavernkeep was excited to see the Qiqirn’s brew, but quickly grew sombre when I informed him that it was recently made. Apparently, Qiqirn Firewater needed to age a year before it reached its full potency. I asked Buscarron if he had heard anything while I was away running his errand and I had finally had a stroke of luck. There had been rumors of Sylph in the area which in and of itself was strange of them to be so far away from their homeland in the eastern region of the Shroud. Buscarron was kind enough to mark on my map where the sightings had been and I rode out to investigate. I didn’t expect to find the Sylph Elder, and I certainly didn’t expect to find evidence of Garlean soldiers. At one of the locations Buscarron had marked I managed to find the remains of an encampment. Some spent material had been carelessly left and I recognized the tough Garlean Rubber used in their armor and some of their machines. With this new information I returned to the tavern and spoke to the proprietor once more. He was deeply concerned about the Garlean soldiers and according to him they had never made it this far into the woods before. It was then that I remembered what I had found outside of Little Solace, and told him of the possible traitor. This only made him more angry. I left the bar to give Buscarron some time to cool off and took up a seat at one of the free tables. I couldn’t help but notice that some of his clientele that afternoon were more of the unsavory kind. From the looks of it, one appeared to be from a local group of poachers known as the Coeurlclaw, and the other from a group of thieves known as the Redbelly Wasps. The two groups were well known for terrorizing the whole of the Shroud and I really should have done my duty as an officer of the Twin Adder and apprehend them, but Buscarron’s Druthers acted extremely well as a neutral territory. I left my seat and approached the two, placing my hands on the table and leaning down to be eye to eye with them. I very quietly introduced myself as an officer of the Twin Adder, but an Adventurer first and foremost, and told them that there seemed to be a troop of Garlean soldiers hiding in the South Shroud somewhere. I was very polite, not threatening at all, honest, as I told them that perhaps it would be a wise decision to put aside any poaching activities or thefts until the invading troops had been taken care of. I then left the table as casually as I had approached it, stopping only to tell them that if they decided otherwise I would end them, and returned to my own seat. I watched the activities in the tavern through the evening, hoping to be there if word of the Sylph Elder or the Garlean troops was spoken. As the night drew on I watched as a Wood Wailer, one of Gridania’s lancers, had begun purchasing rounds for the entire tavern. I figured that perhaps he had received a promotion and was excited, but after the third, fourth, fifth round of drinks for everyone and he continued to pay up I grew suspicious. The man, whose name I learned was Laurentius, left the tavern in a drunken stupor and I followed, leaving behind the raucous laughter and light of the tavern for the silent, dark night of the forest. I caught up with the man with ease and questioned him where he had obtained so much money. He was unwilling to talk and continued his staggering walk deeper into the forest. I made to grab for his shoulder to stop him, but the Wood Wailer slipped from my grasp and dashed off into the forest. I cursed under my breath and chased after the fleeing suspect. As the man pulled ahead of me, weaving his way through the forest and jumping logs and ravines, I couldn’t help but think he was a little too lucid to be drunk. After a good fifteen minutes of chase, I almost considered letting the man go, but he had stopped running and I came up alongside him. I threw him up against a boulder and accused him of selling information and supplies to the Garlean forces, told him I was an officer of the Twin Adder and that I would be taking him in. The whole time Laurentius laughed. I heard shuffling in the dark woods behind around us and someone lit a torch. One by one, torches were lit and I realized that I had been drawn into a trap, which Laurentius was kind enough to confirm. There were easily thirty Garlean soldiers. It had seemed that the soldier my Carbuncle familiar chased after days before outside Little Solace had gotten away and warned his contingent. As the Garleans drew nearer Laurentius began laughing again. I turned deftly on my heel and slugged him squarely in the jaw, knocking him clear off his feet and to the ground. I followed the motion up by grabbing my grimoire from its holster on my hip and opened it with a flourish. The pages flapped as I chanted the formula in my head, preparing a volley at the nearest soldier. I was incredibly outnumbered, but I wouldn’t go down without taking as many of them with me as I could. The enemy soldiers moved toward me like a wall of human flesh and I fought down the memories of Cartenau. It was no use, they’d reach me long before I even finished casting a single spell. I heard the sharp twangs of bowstrings, the whistle of arrows flying through the air, and the first rank of soldiers collapsed, causing the second row to trip over them. There was a loud shout and by the firelight I could see a number of people rushing the Garleans’ rear flank. The Redbelly Wasps attacked the Garleans with their spears and another round of arrows flew from the Couerlclaw Poachers hiding in the trees. The combined forces of the outlaws had decimated the Garlean troops within moments and I let out a sigh of relief. It turned out that the two I had spoken to in Buscarron’s Druthers were influential members of each group, and they admired my audacity to speak to them in such a manner. Just as I had been watching Laurentius in the bar, they had been watching me. As soon as I left in pursuit of him, they had gathered up their members and followed me. The Garleans were a threat to all Eorzeans, law-abiding and law-breaking alike. They told me that this was the first and last time they’d be working with me as an officer of the Twin Adder, but as an Eorzean they’d always fight by my side. I managed to rouse Laurentius back to consciousness and marched him right to Buscarron’s Druthers. There we put the traitor under intense guard until more authorities could arrive. Laurentius asked how I had managed to defeat the Garlean troops and I told him that the two criminal groups came to my aid. I had never seen a man who looked so ashamed as he realized that two of Gridania’s most notorious criminal groups were willing to work together, with a Gridanian officer, to bring down the Garlean forces. He begged and pleaded for mercy, and I felt deep down that he was sincere. All the same, his fate was up to the Twin Adder now. Buscarron congratulated me for a job well done and informed me that while I was out running through the forest some information on the missing Sylph had arrived. Apparently, the Sylph Elder had been spotted fleeing Garlean soldiers days ago. My excitement was blown away by Buscarron’s next statement. The Sylph Elder had indeed escaped the Garlean forces, and did so by seeking shelter in one of the worst places possible. Named after a monstrous beast of Padjali folklore, it was abandoned over three decades ago and had come to be regarded as the seventh hell made manifest. The Thousand Maws of Toto-Rak. And today's entry is where I realize even the game isn't a good source for screenshots. I wanted to get a shot from the cutscene in the quest, Nouveau Riche, where you're surrounded by Garlean troops, but XIV doesn't actually let you view those cutscenes again. I did however manage to snag some screenshots from the cutscenes in Toto-Rak so you'll get to enjoy those tomorrow. I truncated one of the quests in this arc, the Qiqirn Firewater to be precise. It doesn't really make sense to me at all. Go get spring water, get five coeurl whiskers, turn it in. Then the Qiqirn needs some time to make it. Which, there is no actual wait. Perhaps, all of five seconds, or however long it takes you to move on to the next quest. I figured a liquor would take, you know, a number of months to brew? So, I just made him have it already. Like I've said before, some things make sense in game as a means to slow you down, but when you start to write it into a story format things need to be changed so it flows better. Gonna try to have a post for tomorrow, it's a dungeon episode. I've got some work to do and then I have to figure out who will actually be in the party. I'm trying to give the rest of the supporting cast equal time and it's turning out to be tricky with these four man dungeons. I do already know who will be coming along for the next dungeon though. So, whether I have a post up tomorrow or the day after, please look forward to it. EDIT: Oh my god, Kinja, just oh my god. Anyone else having issues?